Download "Accreditation Role of the National Universities Commission and the Quality of the Educational Inputs into Nigerian University System"
2 Universal Journal of Educational Research 2(9): , Academic Standard (MAS) for the thirteen broad disciplines taught in the Nigerian Universities by setting up panels of experts in academics in these discipline and comments by Universities Faculties and departments on the draft MAS produced by the panel were duly incorporated into the documents after which they were given formal approval by the Federal Government in July 1989 (Ramon-Yusuf, 2003). The Minimum Academic Standards (MAS) documents which the Commission produced in 1989 provided for minimum floor space for lecturers, minimum laboratory facilities per student, minimum library space, library holdings and their currency as well as minimum staff/student ratio for effective teaching and learning in any given discipline. It also stipulates a curriculum as well as minimum entry and graduation requirements for each discipline. 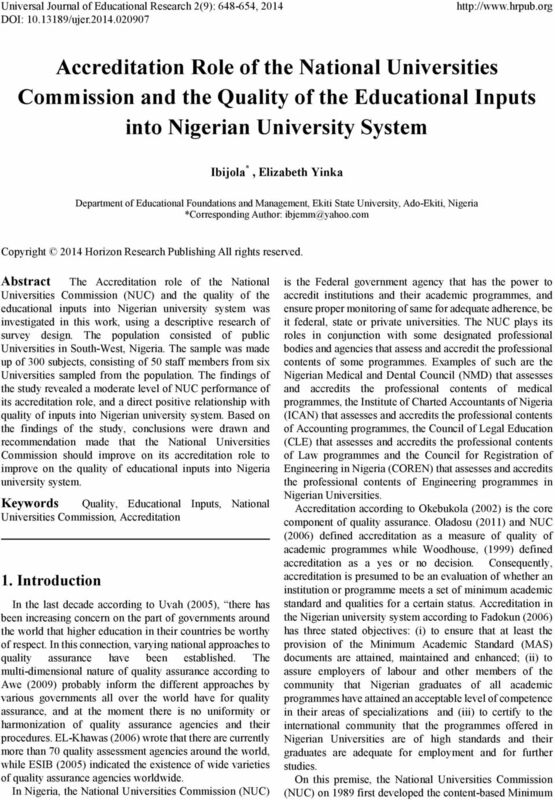 According to Uvah (2005) the NUC organized a Stakeholders Conference on Curriculum Review in April 2001 during which panels of experts, academics and professional bodies drew up panels of academics which incorporated comments of universities into the draft documents to produce national benchmarks. Subsequently, in 2004 according to Uvah, the Commission constituted teams of experts and academics to merge the Minimum Academic Standards (MAS) with the Benchmark Statements into a single document, the Benchmark-MAS for the different disciplines. These documents have been used and are being used by the NUC as benchmarks for accreditation as an external regulatory mechanism for enhancing quality in Nigerian universities (Uvah, 2005). However, Uvah further asserted that the Minimum Academic Standards are subject to review every five years in order to update them in line with technological advances and changing societal needs. 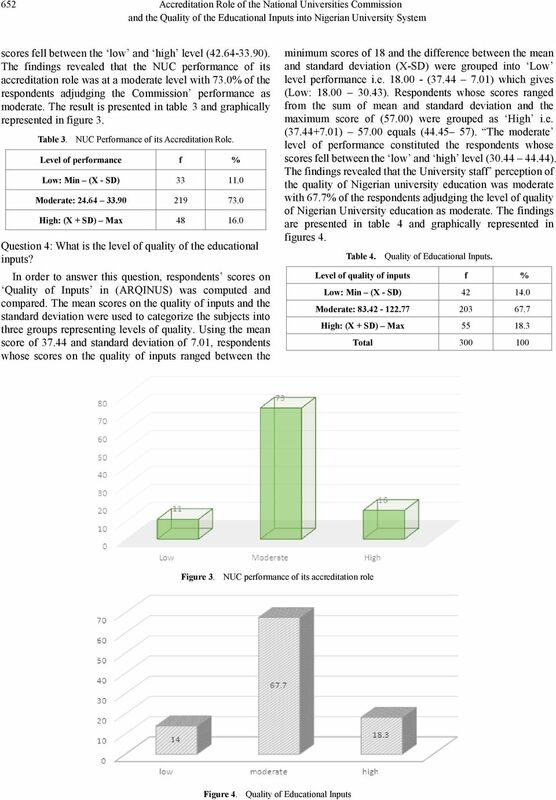 Although NUC (2007) defined quality assurance as a key component of successful internalization, mechanism for building institutional reputation in a competitive local and global arena and necessary foundation for consumer protection, most stakeholders in university education however make it appears the NUC is finding it difficult to achieve all these. Okwuofu and Aminu (2013) reported that the Academic Staff Union of Nigerian Universities (ASUU) claimed that the NUC accreditation exercise, which gave a controversial clean bill of health to most universities in the country, were the result of what is called an un-ethical accreditation exercises because the NUC was alleged of regulating quantity instead of ensuring quality delivery. Subsequently, there have been series of complaints from the public domain about the accreditation exercise of the NUC and observations seem to be pointing towards the absence, utter disregard or failure of regulatory system within the Nigerian university system (Aboderin, 2012). In the absence of improved facilities to cope with increased demand for university education, many of the universities had to exceed their carrying capacities, which are defined as the maximum number of students that each university can sustain for qualitative education based on available human and material resources (NUC, 2005). The provision of adequate and quality physical infrastructure such as lecture theatres, laboratories, student hostels and residential quarters for teaching and non-teaching staff seem to have been replaced by overcrowded classes, resulting in poor quality teaching and research, examination malpractices and high lecturer/student ratio. Amaka (2012) noted with concern the fraud and self-deception with regard to accreditation processes of the NUC as many states, without a proper assessment, establish university for ego and political reasons. Corroborating this view, Akinyanju (2012) asserted that the level of fraud that the NUC is over the years is evident in situations when department of Microbiology for instance is granted full accreditation in three different universities where there were 26 microscope available for a practical class of 150 students in ratio (1:6), 10 microscope to 220 students (1:22) and four (4) microscopes to a class of 100 students (1:25) respectively. This view is also supported by the Punch editorial comment (2013, August 16) which posited that those universities which otherwise could have failed necessary quality tests, were forced to be given approval because they are government-owned. The NUC as the government regulatory agency mandated by law to act as a catalyst for positive change for the delivery of quality university education, has lost focus, (the Punch Editorial 2013, August 16) submitted. The report claimed that the NUC has bastardized and corrupted its accreditation exercise and consequently has lost focus. Okwuofu and Aminu (2013) reported that the Academic Staff Union of Universities has reiterated its call for the scrapping or an overhaul of the NUC. It is on this note that Ade-Ajayi (2003) advocated for an outright proscription of the NUC. According to Okwuofu and Aminu (2013) s report, ASUU posited that the Commission has failed to reposition the nation s universities as shown by the NEEDS assessment report carried out by genuine academics, which contradicted the NUC s accreditation exercise. According to the report, ASUU claimed that the NUC accreditation exercise, which gave a controversial clean bill of health to most universities in the country, were the result of what is called an un-ethical accreditation and that the NUC has allegedly been regulating quantity instead of ensuring quality delivery. Belo-Osagie (2012) reported that the NEEDS Assessment committee was shocked by the unsatisfactory quality and quantity of academics, poor state of hostels and toilet facilities, high number of abandoned projects, poor state of laboratories compared with the usually beautiful pictures painted by University administrators in their convocation speeches. Akinyanju (2012) submitted that Nigerian universities source for Internally Generated Revenue (IGR) by creating additional non-nuc vetted courses which are fee-paying. Consequently, the non-abating crisis in the accreditation process of courses in the system is headlined by the fiasco that sees students graduating, only for the NUC to declare that it did not approve their courses (Atoyebi and Oyeleke, 2013). 7 654 Accreditation Role of the National Universities Commission and the Quality of the Educational Inputs into Nigerian University System recommendation may have negative impact on the educational system. 7. Recommendations In view of the established findings of the study, the following recommendations were made. The National Universities Commission as a regulatory body charged with the statutory responsibility of ensuring globally competitive university education in Nigeria, should improve on its accreditation role by giving optimal performance. Acknowledgements The Researcher wishes to express her profound gratitude to Dr. (Mrs) Akomolafe, Comfort Olufunke, who was the Researcher s PhD supervisor in the Department of Educational Foundations and Management, Ekiti State University, Ado-Ekiti, Nigeria. Her diligent supervision and professional guidance aided the quality of the Ph.D Thesis part of which is being published in this paper. REFERENCES  Aboderin, M. (2012, November 13). ICPC, NUC Strengthen War against Corruption in Varsities. The Punch pp. 48. Ade- Ajayi, J. F. (2003). Position paper presented at the University Stakeholders National Consultative Forum. Abuja: Federal Ministry of Education, March 1-4. pp. 42. Akinyanju, P. (2012, July 30). Appreciating funding of public universities. The Punch pp. 17. Amaka, A. (2012) Education Budget and its Implications (Analysis). Retrieved on 12/08/2013 from et-and-its-implications-analysis/  Atoyebi, O. and Oyeleke, S. (2013, September 23). ASUU blasts NUC, says strike continues. The Punch, pp. 15. Awe, A. B. (2009). 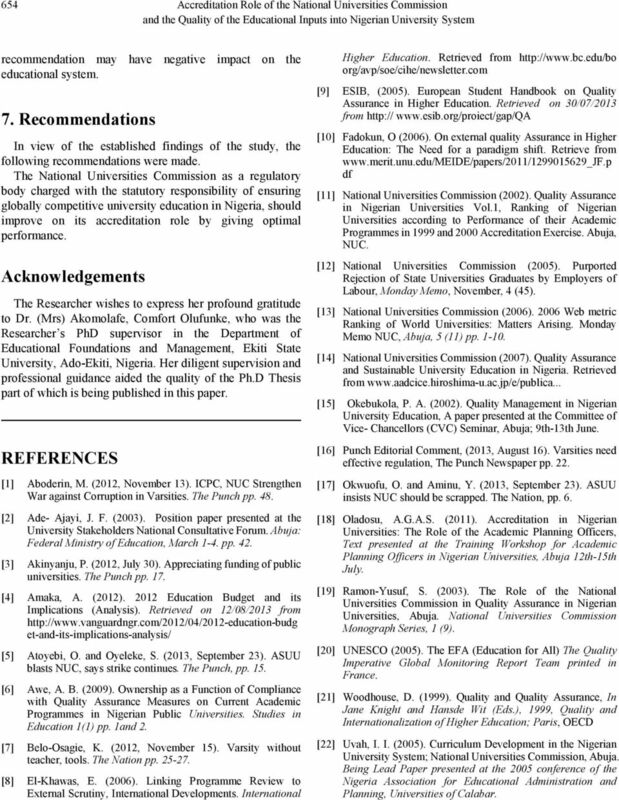 Ownership as a Function of Compliance with Quality Assurance Measures on Current Academic Programmes in Nigerian Public Universities. Studies in Education 1(1) pp. 1and 2. Belo-Osagie, K. (2012, November 15). Varsity without teacher, tools. The Nation pp  El-Khawas, E. (2006). Linking Programme Review to External Scrutiny, International Developments. International Higher Education. Retrieved from org/avp/soe/cihe/newsletter.com  ESIB, (2005). European Student Handbook on Quality Assurance in Higher Education. Retrieved on 30/07/2013 from  Fadokun, O (2006). On external quality Assurance in Higher Education: The Need for a paradigm shift. Retrieve from df  National Universities Commission (2002). Quality Assurance in Nigerian Universities Vol.1, Ranking of Nigerian Universities according to Performance of their Academic Programmes in 1999 and 2000 Accreditation Exercise. Abuja, NUC. National Universities Commission (2005). Purported Rejection of State Universities Graduates by Employers of Labour, Monday Memo, November, 4 (45). National Universities Commission (2006) Web metric Ranking of World Universities: Matters Arising. Monday Memo NUC, Abuja, 5 (11) pp  National Universities Commission (2007). Quality Assurance and Sustainable University Education in Nigeria. Retrieved from  Okebukola, P. A. (2002). Quality Management in Nigerian University Education, A paper presented at the Committee of Vice- Chancellors (CVC) Seminar, Abuja; 9th-13th June. Punch Editorial Comment, (2013, August 16). Varsities need effective regulation, The Punch Newspaper pp. 22. Okwuofu, O. and Aminu, Y. (2013, September 23). ASUU insists NUC should be scrapped. The Nation, pp. 6. Oladosu, A.G.A.S. (2011). Accreditation in Nigerian Universities: The Role of the Academic Planning Officers, Text presented at the Training Workshop for Academic Planning Officers in Nigerian Universities, Abuja 12th-15th July. Ramon-Yusuf, S. (2003). The Role of the National Universities Commission in Quality Assurance in Nigerian Universities, Abuja. National Universities Commission Monograph Series, 1 (9). UNESCO (2005). The EFA (Education for All) The Quality Imperative Global Monitoring Report Team printed in France. Woodhouse, D. (1999). Quality and Quality Assurance, In Jane Knight and Hansde Wit (Eds. ), 1999, Quality and Internationalization of Higher Education; Paris, OECD  Uvah, I. I. (2005). Curriculum Development in the Nigerian University System; National Universities Commission, Abuja. Being Lead Paper presented at the 2005 conference of the Nigeria Association for Educational Administration and Planning, Universities of Calabar. Quality and critical appraisal of clinical practice guidelines a relevant topic for health care?